Matthew Bland Harrison made much history in his time. He came to Duluth with very limited means, but was a member of one of the old families of Virginia, a man of great energy and foresight, and a good judge of real estate. His name will be associated with that period of Duluth’s history as long as the city stands. He bought wild lands at both ends of the city, one for fine residential property, and the other for factory and business sites; and his judgment has been confirmed by events. He advertised Duluth more liberally and more efficiently than any other man of his time, and he soon became one of the largest dealers in Duluth. He joined the Merritts in the opening up of the Mesabi range, and helped build the Mesabi Railroad. He died of Brights Disease in February 1892, and his death was a great loss to Duluth. When Harrison died in 1892, Lucy returned to her native Virginia. The house became a college preparatory school from 1896 to 1900. 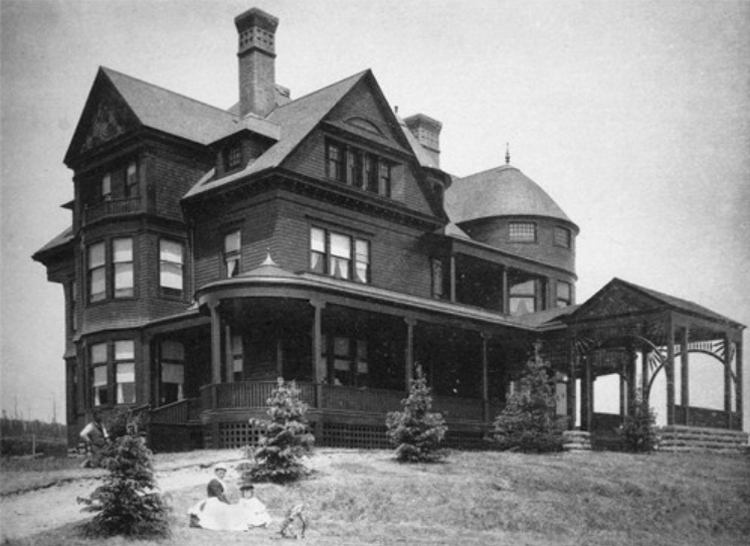 Albert and Julia Marshall — for whom the University of Minnesota Duluth’s Marshall Performing Arts Center is named — lived here from 1901 until 1932. The house was demolished in 1935 and three houses were built on the large lot in the 1930s. Built for $11,000 (about $260,000 today), it was a good example of a Shingle-style house: patterned shingles covering wall surfaces, a large half tower whose roof line blended into the house, and an open, arched porte-cochere.